"Hey, wait a minute" she said as she looked around at us all. Then, pointing at each person around the room, starting with herself, she said "Jew, Jew, Jew, Jew, Jew, Jew, Jew, Jew, Jew, Jew ..." and when she finally arrived at me she said "Jew by Association". We all had a good laugh. It didn't mean a thing, of course; that sort of thing didn't matter in the CLE where most people get along swell and we don't have separate bars like a lot of less-enlightened cities, but it was a funny observation. 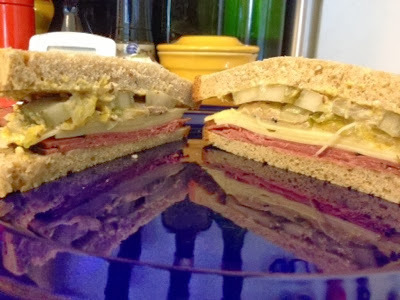 I have no doubt in my mind that this sandwich exists in a deli somewhere under another name, but since I'd made three of the ingredients myself I'm going to dub it "The Associate". Today I, and all of Chowbacca!, send love to all of our favorite Jews and wish them, and the world, a happy, healthy, Hanukkah. We're thankful for you all.